Last week, from Oct. 6 to 9, the National Mall in Washington, D.C. was filled with tents, worship music and prayer for the “Awaken the Dawn” rally. 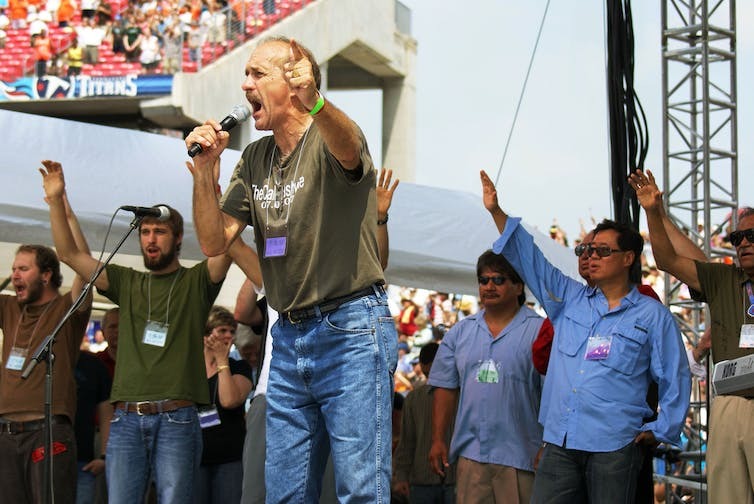 The purpose of the event, according to organizer Lou Engle, was to “gather around Jesus,” to pray for the nation and its government. It ended with a day of prayer by Christian women. This wasn’t the first such event. On April 9, 2016, at the Los Angeles Memorial Coliseum, tens of thousands of people gathered to pray for the supernatural transformation of America. Five years earlier, in August of 2011, more than 30,000 people cheered wildly as the then U.S. presidential candidate and Texas Governor Rick Perry – now secretary of energy in the Trump administration – came to the center stage at “The Response: A Call to Prayer for a Nation in Crisis” at Reliant Stadium in Houston. Worshippers pray with Texas Gov. 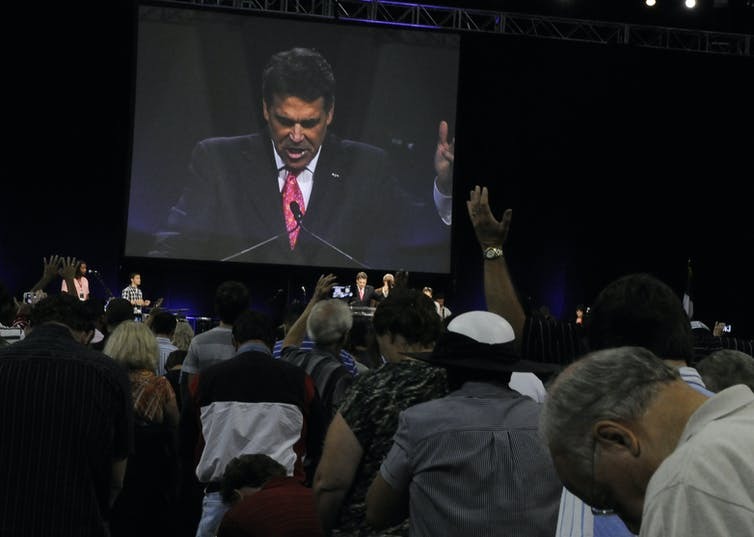 Rick Perry, seen at center and on screen, at The Response, a daylong prayer and fast rally, Aug. 6, 2011, at Reliant Stadium in Houston. Based on our research, we believe that INC Christianity is significantly changing the religious landscape in America – and its politics. INC Christianity is led by a network of popular independent religious entrepreneurs, often referred to as “apostles.” They have close ties, we found, to conservative U.S. politicians, including Sarah Palin, Newt Gingrich, Bobby Jindal, Rick Perry and more recently President Donald Trump. It is not focused primarily on building congregations but rather on spreading beliefs and practices through media, conferences and ministry schools. It is not so much about proselytizing to unbelievers as it is about transforming society through placing Christian believers in powerful positions in all sectors of society. It is organized as a network of independent leaders rather than as formally organized denominations. INC Christianity is the fastest-growing Christian group in America and possibly around the world. Over the 40 years from 1970 to 2010, the number of regular attenders of Protestant churches as a whole shrunk by an average of .05 percent per year, which is a striking decline when one considers that the U.S. population grew an average of 1 percent per year during those years. At the same time, independent neo-charismatic congregations (a category in which INC groups reside) grew by an average of 3.24 percent per year. Its impact, however, is much greater than can be measured in church attendance. This is because INC Christianity is not centrally concerned with building congregations, but spreading beliefs and practices. Bill Johnson, pastor of Bethel Church in Redding, California. 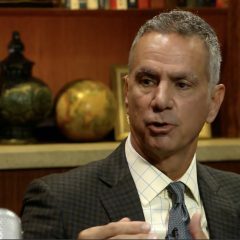 The influence of INC Christianity can be seen in the millions of hits on many of their web-based media sites, large turnouts at stadium rallies and conferences, and millions of dollars in media sales. In our interviews with leaders, we found that Bethel, an INC ministry based in Redding, California, for example, in 2013 had an income of US$8.4 million in sales of music, books, DVDs and web-based content as well as $7 million in tuition to their Bethel School of Supernatural Ministry. As part of our research, we conducted in-depth interviews with senior leaders, staff and current and former participants in INC Christian ministries. We also conducted supplementary interviews with Christian leaders and scholars with knowledge of the changing religious landscape and attended conferences, numerous church services, ministry school sessions, healing sessions and exorcisms. In all, we conducted 41 in-depth interviews. Our primary conclusion is that the growth of these groups is largely the result of their network governance structure. When compared to the oversight and accountability of formal congregations and denominations, these structures allow for more experimentation. This includes “extreme” experiences of the supernatural, unorthodox beliefs and practices, and financing as well as marketing techniques that leverage the power of the internet. In our research, we witnessed the appeal of INC Christianity, particularly among young people. We saw the thrill of holding impromptu supernatural healing sessions in the emergency room of a large public hospital, the intrigue of ministry school class sessions devoted to the techniques of casting out demonic spirits and the adventure of teams of young people going out into public places, seeking direct guidance from God as to whom to heal or to relay specific divine messages. In addition to the growth numbers, the importance of INC Christianity lies in the fact that its proponents have a fundamentally different view of the relationship between the Christian faith and society than most Christian groups throughout American history. 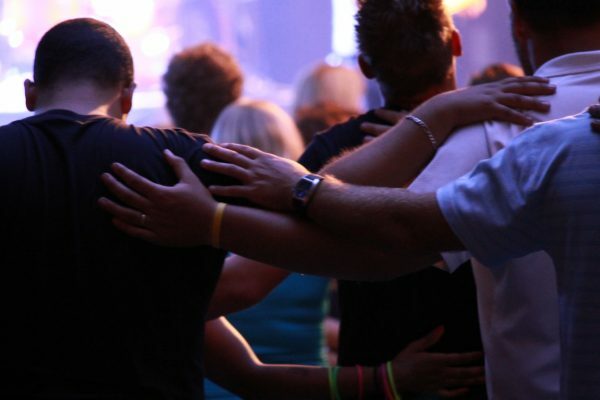 Most Christian groups in America have seen the role of the Church as connecting individuals to God through the saving grace of Jesus and building congregations that provide communities of meaning and belonging through worship services. They also believe in serving and providing for the needs their local communities. Such traditional Christian groups believe that although the world can be improved, it will not be restored to God’s original plan until Jesus comes back again to rule the Earth. Lou Engle, an American Charismatic Christian leader. INC beliefs, however, are different – their leaders are not content simply to connect individuals to God and grow congregations. Most INC Christian groups we studied seek to bring heaven or God’s intended perfect society to Earth by placing “kingdom-minded people” in powerful positions at the top of all sectors of society. INC leaders have labeled them the “seven mountains of culture.” These include business, government, media, arts and entertainment, education, family and religion. In this form of “trickle-down Christianity,” they believe if Christians rise to the top of all seven “mountains,” society will be completely transformed. We heard these ideas repeatedly in most of our interviews, at events we attended and in INC media materials. Most significantly, since the 2016 presidential election, some INC leaders have released public statements claiming that the Trump presidency is part of fulfilling God’s plan to “bring heaven to Earth” by placing believers in top posts, including Rick Perry; Betsy DeVos directing the Department of Education; and Ben Carson leading the Department of Housing and Urban Development. INC Christianity is a movement to watch because we think it will continue to draw adherents in large numbers in the future. It will produce a growing number of Christians who see their goal not just as saving souls but as transforming society by taking control over its institutions. We see the likelihood of INC Christians taking over the “seven mountains of culture” as slim. However, we also believe that this movement is sure to shake up the religious and political landscape for generations to come. This is an updated version of a piece originally published on March 15, 2017. Click here to read the original article on The Conversation. Brad Christerson is a contributing fellow with the Center for Religion and Civic Culture.